365 days a year and on-site within 1 hour of your call. 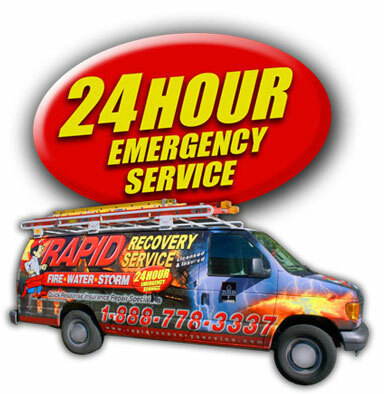 Contact Rapid Recovery Service for any Fire, Water, Storm, Flood or Mold Damage in Michigan. Rapid Recovery Service’s team has over 50 years of combined experience in the insurance restoration industry. Our goal is to help property owners recover from disasters in Michigan ranging from a house fire to windstorm or water damage caused by floods. As a result, our team can also help provide assistance with tree removal or water extraction. Also experts in cleanups for sump pump backups, storm damage as well as mold, and asbestos testing/removal. Furthermore, if your property is exposed to any fire, water, flood, storm or mold damage contact us immediately! Finally, our IICRC professionals will arrive onsite within 1 hour to clean up all water, fire, and mold damage. Also, we are here to help you when you need any fire, water cleanup or repair. Therefore our kind, caring, and experienced staff will help you understand and work with you throughout the entire fire and water restoration process. Furthermore, we also have an onsite secure contents restoration facility, individual rooms, ozone chamber and more! Please note: consequently all requests must be confirmed via email. Most important, Rapid Recovery Service prides itself on integrity and respect. When homeowner’s lives are disrupted, promptness and quality workmanship are the primary goals. As a result, we are proud contributors to the communities we serve.